You’ve just acquired a brand spanking new car, and your life now almost feels surreal. Everything about it is just perfect, and you couldn’t be prouder of yourself. Of course, you can’t wait to take it out for a ride on Michigan’s roads. Because nothing is as exciting as cruising down the highway while listening to music and enjoying that new car smell. Well, congrats. It’s definitely an admirable achievement. The stuff of dreams. At least it seems like one. But unfortunately, you’re not there yet, because of one major caveat- traffic risks. In 2017 alone, Michigan saw 314,921 road crash incidents, 937 of which were fatal. 57,263 of the cases resulted in some form of bodily injury, while 256,721 caused property damage. All in all, 78,394 individuals were injured, and 1,028 were not fortunate enough to make it out alive. Source: Michigan You might be the keenest and most careful driver in the state. We’ll give you that. But if you review information compiled by the State of Michigan, there are numerous causes behind these crashes. They range from the obvious like “overspeeding” and “reckless driving”, to the least expected like “failure to yield”. Essentially, even when you’re super careful, another road user might trigger an accident. It’s a wild world out there in the streets. That’s why Michigan State legislation requires each driver to purchase liability insurance. To essentially cater for possible resultant injuries and property damage. Unfortunately, road crashes are barely a fraction of the risks your new car faces. Even if it successfully survives the crazy traffic jungle, there are numerous other things to worry about. Thugs might spot it right when they are looking out for that specific model. And you know there’s nothing as irresistible as a new car, especially when it comes to grand theft auto. Of course, you might try to secure it accordingly. But Michigan, in recent years, has proven to be the Wild West of motor vehicle theft. We don’t deal with amateurs anymore. Only professionals. When car makers introduce new security features, the thieves have always found ways around them. That’s how they were able to steal close to 20,000 vehicles in 2016. And surprisingly, most of them vanished completely since only 49% were recovered. Sadly, that’s not all. If you avoid road crashes, and potential thieves fail to notice your car, nature might still get it. A tree might fall on it during a storm, or a technical hitch might ignite a fire. Principally, whichever way you look at it, there are risks everywhere. That’s why auto insurance is critically important. The broader the coverage in your policy, the more you’ll be protected from these risks. Although such optional policies are usually costlier than standard compulsory insurance, cautious vehicle owners have always gone for them. Hence the full coverage auto insurance. But what exactly is this? And is it even suitable for vehicle owners in Michigan? You’ve probably seen auto insurance providers marketing numerous different kinds of coverage. Each is priced separately, addressing a specific risk. So, of course, it might make sense that the same companies would also consider bundling them into one special buffet policy. At least to cater to customers who might be seeking to simply protect themselves from all possible auto-related risks. Hence the all-too-common term, “full coverage auto insurance”. But let’s get something clear right off the bat. Technically, there’s actually no such thing as full coverage in the motor insurance circles. You might have heard other car owners and probably a couple of insurance agents throw the term around. But you can’t walk into an insurance company and request to purchase a full coverage policy. It simply doesn’t exist. At least officially. Wait a minute. Does this mean that insurance providers do not allow bundling of multiple types of coverage in one policy? The insurance industry would actually be dead if this was the case. As a business, an insurance company will even encourage you to acquire additional coverage. The more the bundling, the higher the subsequent profits. So the concept does apply to the entire industry. The only thing that is technically inexistent is “full coverage auto insurance” as an official policy name. The thing is, as an unofficial term, the definition can vary significantly depending on who you’re dealing with. The industry is pretty extensive, with numerous companies offering varying auto insurance coverage. An insurance coverage that provides full protection should have at least two primary parts. One that addresses general liabilities, and another for comprehensive benefits. Liability insurance, as we’ve previously discussed, covers damages resulting from road accidents. In addition to bodily injuries, it extends to physical damages on third party vehicles and property. It’s essentially the only type of insurance that is required by law in each of the American states. Only slight details vary when you shift from one state to another. Fortunately, Michigan has one of the most comprehensive liability insurance packages in the country. While most states only limit this to at-fault third party damages, Michigan is among the 12 states that have included personal injury protection. As the name suggests, Personal Injury Protection applies to first person injuries. Regardless of whether you’re at fault or not, the insurance company should take full responsibility for your injuries until you ultimately recover. The best thing about this is the fact that you won’t be required to pay even a dime for your medical treatment. As a matter of fact, it doesn’t even have maximum limits. Whatever the extent of your injuries, there’s no ceiling on the medical amount payable. And that’s not all. Even after catering for your bills, the insurer should also ensure that you’re comfortable by compensating for lost income. In addition to a payout amounting to 85% of lost income, you should receive a daily household subsidy not exceeding $20 per day. In some cases, these handouts can extend for as long as 36 months after a traffic incident. 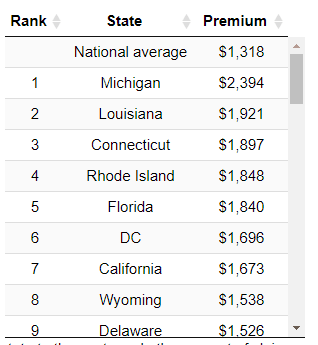 Certainly explains why Michigan has the highest average auto insurance rate in the U.S. At $2,394, it ranks ahead of second-placed Louisiana at $1,921. It even surpasses the national average of $1,318 by more than $1,000. All things considered, bodily injury is only one of the possible consequences of a road accident. That’s why Michigan’s liability insurance also includes Property Protection Insurance. This helps you offset the costs of repairing any third party property damage you cause in a road crash. But, unlike the former, it has a limit. Insurance companies will not pay more than $1 million per crash. But, to be fair, that’s still a significantly huge amount of money, considering the standard cost of properties usually damaged in a typical road crash. Interestingly, it does not extend to all properties. Insurance payouts are only made for properties that were stationary at the time of impact. This disqualifies other drivers’ cars unless they were parked and immobile. Don’t be alarmed though. The insurer won’t completely bail out if other damaged vehicles were moving. Instead, they’ll switch to the third component of Michigan’s liability insurance- Bodily Injury and Property Damage (Residual BI/PD). This entirely addresses third-party injuries and property damage in accidents you cause. Unlike the previous two, this coverage has stated limits you can pick from. However, you’re required to proceed with an option that provides a protection of at least $20,000 for each injured individual. When the number of injured persons is two or more, the least expected coverage is $40,000, while $10,000 applies to property. If affected parties are dissatisfied with the initial payout offers, the law grants them the right to sue for additional benefits. This could potentially be costly even to you, especially if your limits are comparatively low. That’s because insurance companies will never extend past the set limits. If the court settles for a higher amount, any deficit amount after limit deduction should be paid directly by you. Michigan’s liability insurance is solid enough. But it’s barely comprehensive, probably to minimize legal insurance costs. One substantial element that is prominently missing in each of the three liability coverage types is the first-person vehicle. As long as you’ve fully settled costs for third-party damages, the state doesn’t really care what you do with your car. If it’s totaled, you might as well dump it in a wrecking yard. Or sink it in Lake Michigan. But if you care about it, you should consider adding Collision Insurance to your full coverage auto insurance. It’s more or less like a PIP for your vehicle. Regardless of the party that is at fault, your insurer is expected to asses and repair any damages to your car. It’s pleasantly swift because you don’t even have to wait for a payout from the other driver’s insurance provider. Unfortunately, just like all other favorable policies, it has its downside. It’s typically the costliest auto insurance coverage, and could potentially even double your premium. Luckily, you can mitigate this by choosing a significant deductible, which normally ranges between $50 and $2,000. The higher the deductible, the lower the subsequent premium. So far, we’ve fully addressed possible road accident liabilities and damages. But that’s barely half the tale. You still need protection from other risks as previously mentioned. And that’s where Comprehensive Insurance comes in. This coverage applies to your car pretty much like collision insurance. But, instead of accidents, it only covers damages triggered by external forces. Like, for instance, vandalism, an errant object going through your windshield, or a tree falling on your car. Thankfully, since these events are rare and avoidable, comprehensive insurance is considerably cheaper than collision insurance. ● In 2017 alone, Michigan saw 314,921 road crash incidents, 937 of which were fatal. 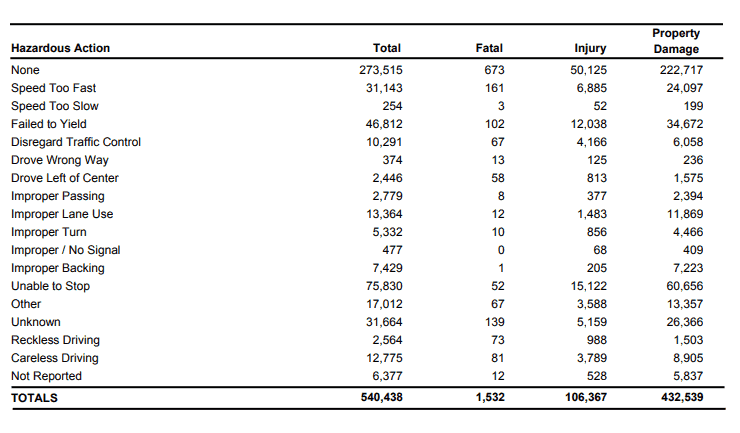 57,263 of the cases resulted in some form of bodily injury, while 256,721 caused property damage. All in all, 78,394 individuals were injured, and 1,028 were not fortunate enough to make it out alive. ● There are numerous causes behind these crashes. They range from the obvious like “overspeeding” and “reckless driving”, to the least expected like “failure to yield”. 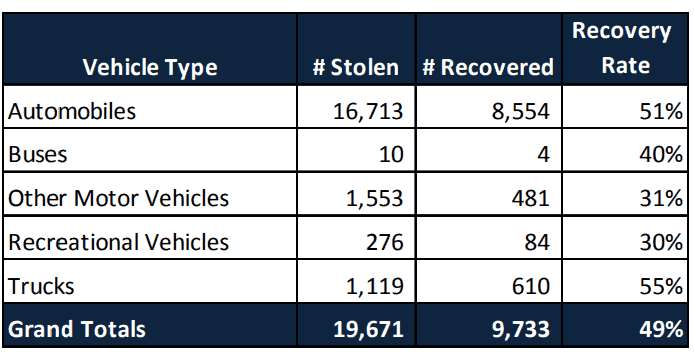 ● Thieves were able to steal close to 20,000 vehicles in 2016. And surprisingly, most of them vanished completely since only 49% were recovered. ● If you avoid road crashes, and potential thieves fail to notice your car, nature might still get it. ● Technically, there’s actually no such thing as full coverage in the motor insurance circles. ● An insurance coverage that provides full protection should have at least two primary parts. One that addresses general liabilities, and another for comprehensive benefits. ● Liability insurance, as we’ve previously discussed, covers damages resulting from road accidents. In addition to bodily injuries, it extends to physical damages on third party vehicles and property. ● Collision insurance is more or less like a PIP for your vehicle. Regardless of the party that is at fault, your insurer is expected to asses and repair any damages to your car. ● Comprehensive insurance applies to your car pretty much like collision insurance. But, instead of accidents, it only covers damages triggered by external forces. All in all, this should be an exceedingly beneficial combination of insurance coverage. But they can only serve you well if you’re extremely keen on the selection process from the word go. So talk to us to today and let’s help you secure the most favorable types of coverage, from the best possible insurers, at the lowest quotes in the market.